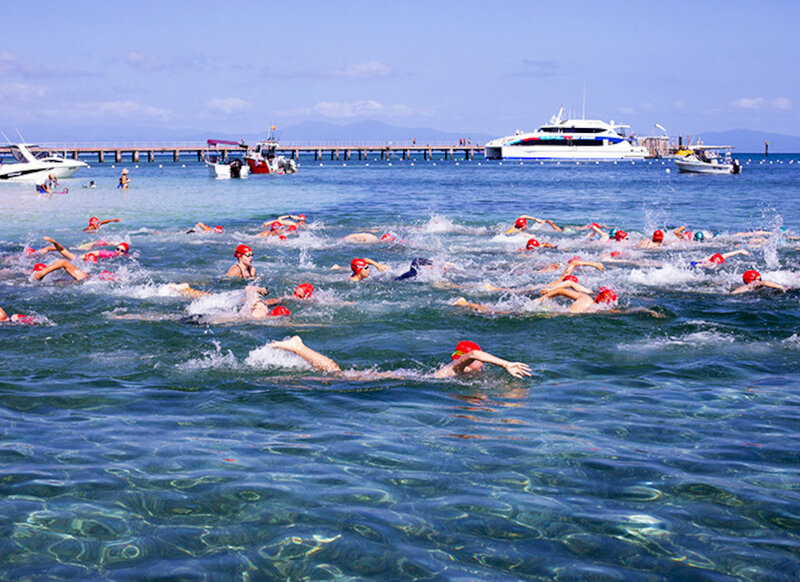 In near perfect conditions with blue skies and gentle winds, 128 swimmers of all ages took to the clear waters of Green Island for the 13th annual Great Adventures Green Island Ocean Swim. Swimmers aged from 12 to 65 competed in 500m, 1.5km and 3km events while the fun “Nippers” swim for the under 12 year olds saw 18 enthusiastic future ocean swimmers enjoy a taste of swimming in the Great Barrier Reef. We were delighted to welcome back many long term local competitors in addition to swimmers from across the State and country including Sunshine Coast, Gold Coast, Sydney, Melbourne, WA as well as international competitors from Japan, UK, USA and Hong Kong. But it was again the talented young Cairns swimmers taking out the wins in all categories. In the 3 km swim, 15 year old Zac Tabuai won the men’s event for the second consecutive year, while 16 year old Ebony Crowe won the Women’s. In the 1.5km swim, 15 year old Alicia Davy broke the course record by 13 seconds to take out the win and 13 year old Rhys Kurukchi won the men’s. The 500 m swim was won by 12 year Bryce Menzies. Once again we offer special thanks to Surf Life Saving Queensland for their wonderful support and community spirit in conducting in-water safety for the event and to the Cairns Crocs Triathlon Club for assisting with the timing.